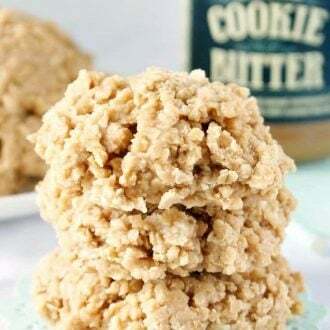 These Cookie Butter No Bake Cookies are a fun twist on the classic recipe we all grew up with! 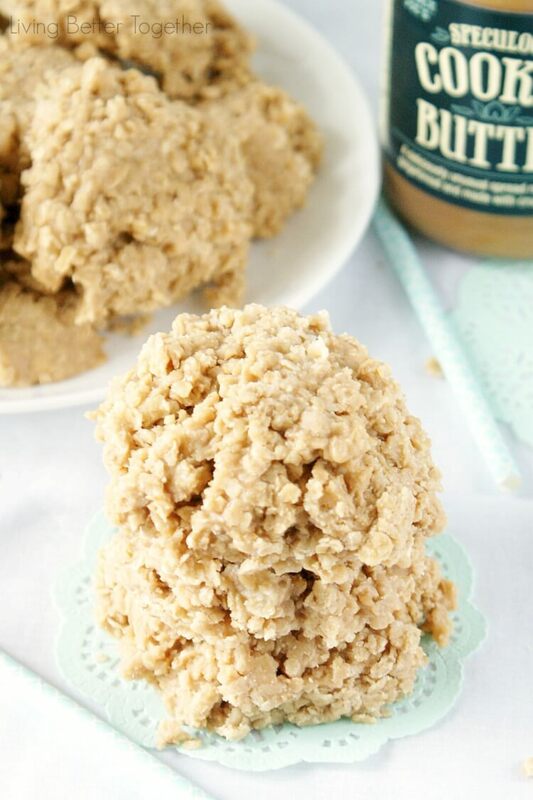 Made with delicious cookie spread, butter, sugar, and oatmeal! 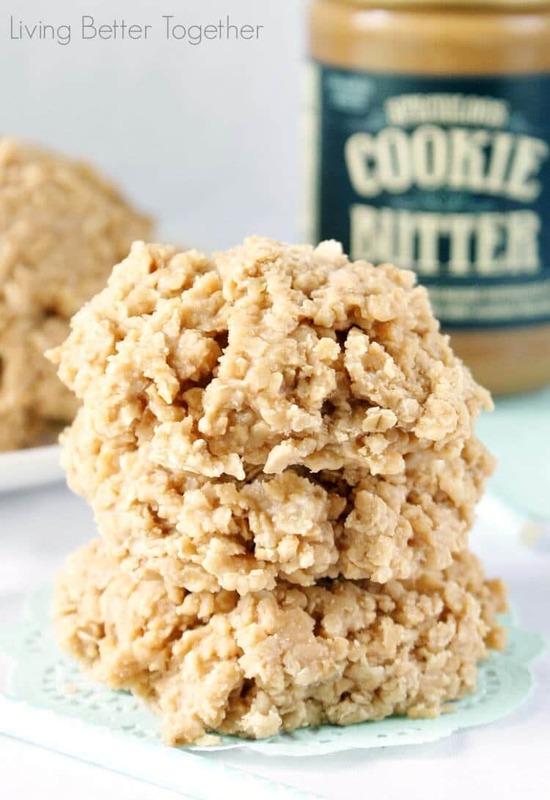 These Cookie Butter No Bake Cookies are so good! Since I first bought Cookie Butter a couple of months ago, my husband has been eating it like crazy, he’s even been putting it on my Molasses Cookies, apparently, the cookie itself wasn’t enough. A few days ago it just hit me, we’ve been using cookie butter in the place of peanut butter on toast and in frosting, why not replace it in my no-bake cookie recipe? These Cookie Butter No Bake Cookies are based off a recipe from one of Matt and I’s old bosses. In high school, we both worked at a local convenient store and she used to make all the cookies. The no bakes were my favorite and I begged her for the recipe! I’ve now been making this same recipe for eight years and I’ve yet to have a bad batch. Matt likes the Biscoff Cookie Spread (found in most grocery stores), where I’m a little partial to the Trader Joe’s Speculoos Cookie Butter. You could use either in the recipe and it would still be amazing! “The cookie is delicious – not too sweet – perfect. It leaves an aftertaste which is gingery, creamy, and even a tad of coconut. DEEElicious!!!”. I love introducing people to cookie butter. You know, creating more addicts… does that make me a bad influence? These are such an easy cookie to make and you don’t even need to turn the oven on, how great is that! They really are the perfect balance of sweetness. Normally, I can’t eat a whole no-bake cookie without consuming a gallon of milk right along with it, but these are just right. Make them for your next get together and watch people ooh and ahh over the amazing flavor… or just keep them all for yourself! They’d be perfect for a cookie swap too! Don’t forget to check out my Strawberry Milk No Bake Cookies and my Bite-Sized Cookie Butter Cream Pies too! Combine sugar, butter, and milk in a medium sauce pan over medium heat. Stirring occasionally, bring to a boil and let boil for 2 minutes. 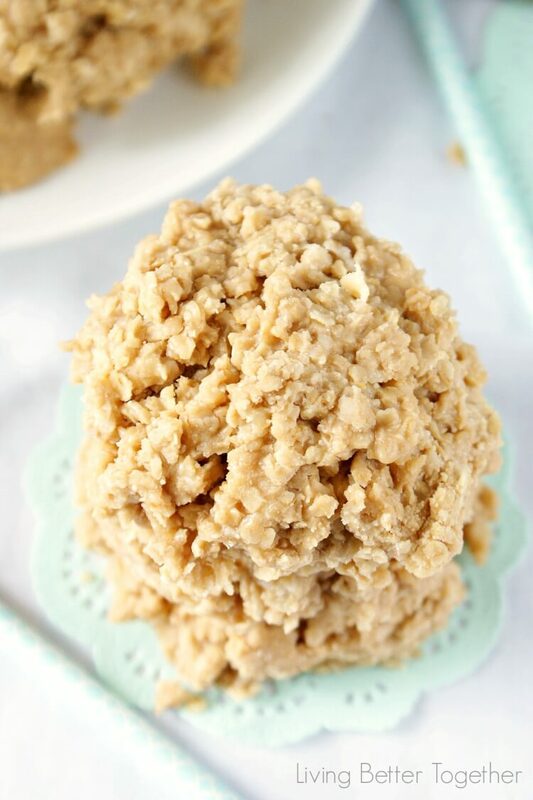 Remove from heat and stir in oatmeal, cookie butter, and vanilla. Stir until mixture starts to thicken and plop quickly onto wax paper. You can also make Chocolate Cookie Butter No Bakes by adding 3 tbsp Baking Cocoa in at the beginning with the sugar, butter, and milk. These look so easy and yummy! They are, they only take a few minutes to make and they’re so good! Of course, is it the Earth Balance butter? I’ve always had good luck with that in my recipes. I’ve made no bakes with almond milk but not rice milk, please do let me know how they turn out! Amanda, you promised to let us know how your version came out…news? Or for the Chocolate ones you could just add the cookie butter with chocolate spread from TJ’s it’s beautiful! Yes, I’ve tried it, I discovered it about a week after making this recipe for the first time!